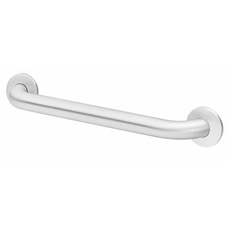 Safety Grip LH Grab Bar - 1.5" OD - 30" x 33"
Safety Grip RH Grab Bar - 1.5" OD - 30" x 33"
Satin Finish LH Grab Bar - 1.5" OD - 30" x 33"
Satin Finish RH Grab Bar - 1.5" OD - 30" x 33"
All Bradley grab bars are designed for safety and security of the physically disabled. Bradley bathroom and restroom shower grab bars are Made In The USA helping keep Americans employed. The safety clearance feature of Bradley grab bars is highly recommended by Barrier-Free design experts and required under most building codes.